Does Kanye West still feel “marginalized” after being given the opportunity to launch a full-scale product and footwear line? There’s no doubt that YEEZY Season has taken 2015 by storm, and although the world of high fashion has taken notice of Kanye’s efforts, it appears that the ones flocking to shops aren’t those in the snobby circles, but the same youth culture that helped him gain prominence in the first place. Now, that same crown isn’t just dropping hundreds of dollars on shoes, but on basic camo-print t-shirts that are priced higher than the base-model Yeezy Boost 350s. 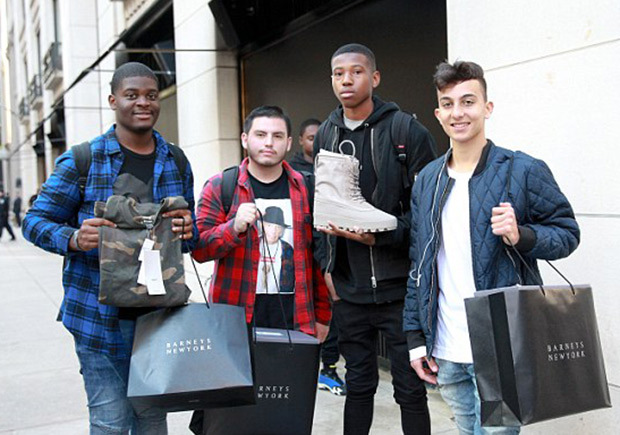 Daily Mail tracked down some photos and quotes from those who camped out at Barney’s in the Upper East Side, mostly comprised of students and young professionals who have found an interest in “fashion” thanks to the influence of Kanye West. And while most stores have sold out of the items that dropped today, the overall reaction to YEEZY Season has been mixed due to the arguably unoriginal style and high prices. It seems that the high fashion crowd isn’t interested in YEEZY Season and those who are still entrenched in the Kanye trance now find it harder (and pricier) to keep up with his spells. It also justifies Nike letting Kanye go because his vision, based on the YEEZY Season pieces, aren’t in line with what Nike is as a brand. At the end of the day, adidas is being more talked-about than ever and their hopes, in the long run, is to increase brand performance in North America. Is it working? Time will tell.